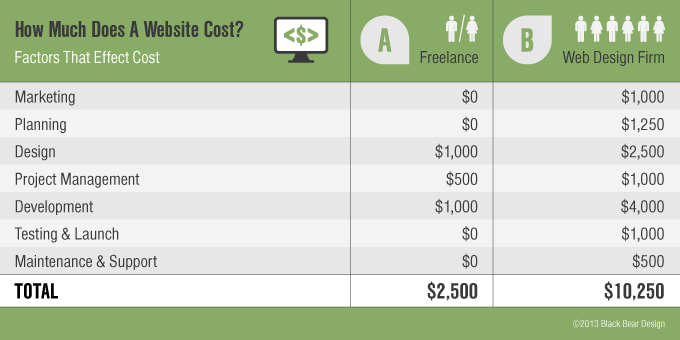 Recently I wrote a post on “How Much Does A Website Cost” which explains in detail the difference in cost you might encounter when pricing web design companies. I used two fictional companies to illustrate the difference each company might charge. Here is a short excerpt of the post to catch you up if you have not read it. I broke down cost in everything from marketing, planning, architecture, design, programming, testing, launch and even post launch support. The takeaway from the post was that you will get what you pay for under most circumstances. If it’s a larger company with more resources and expertise, you will pay more than if its a smaller agency or freelancer. There is nothing wrong with either path you take, your budget many times determines which path you must walk even though the alternate may seem wider and brighter. I am one that operates by the theory that if it doesn’t fit on one sheet of paper, it’s to complicated. I went deeper into the original post than I intended, so i’m circling back and making it a little simpler. Below is a info-graphic that sums up the entire post, hours or writing in an image that will take you all of 15 seconds to understand. If you would like more detail, click over and read the original post. Feel free to share this info-graphic, and please link back to this post if you do. This is for information purposes and is not reflective of any specific website cost. A web design company such as ours has a solution for all customers, mostly!